FANBOY PLANET.com . : mc-disney-avengers-run :. No, We Mean It. You Have To Run! For some time now, Disney has been holding half-marathons, 5k runs, and the like within the borders of its parks. They call the program "runDisney," and it's always a crowded event. Well, next November 14-16 looks to be a lot more crowded, as runDisney announced today that they will be theming the half-marathon to The Avengers, which at this point (2/25/2014) would mark the greatest impact of Marvel Super-Heroes concepts in Disneyland and Disney's California Adventure so far. Registration opens March 25 for the event, which includes a two-day Expo at the Disneyland Hotel Exhibit Hall, also has smaller runs for those who are just not half-marathoners. Disney also has a 5k Family Fun Run, and much, much shorter runs for children through Downtown Disney on Saturday, November 15th. For all, there will also be a Pasta in the Park party, which promises a pasta and pizza buffet (back near Paradise Pier, most likely) which will include character meet and greets. Since they name all the Avengers in the promotional material, they seem a pretty sure bet to make appearances, alongside Mickey and Minnie because Disney. Yet they would be missing a good thing if Ultimate Spider-Man does not make an appearance. Disney promises character appearances and activities every mile in this run that will wind through Disneyland. (Does that seem to be a distraction? Wouldn't you want to stop and rest in order to talk to the Hulk?) 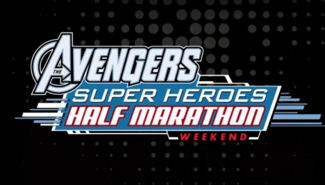 At the end, you will receive a Marvel Super-Heroes' Finisher Medal.